What Are Your Chances of Getting into Medical School? How do you assess your chances of acceptance into medical school? The best way of determining whether you will get into medical school is to look at some of the statistics pertaining to medical school admission and the factors that schools consider when evaluating applicants. Keep in mind however, that statistics are just a guide and that your chance of admission can be increased by managing your application strategically in terms of your timing, choice of schools, and your primary application package. With an aging population and a major anticipated increase in the number of insured people in the United States (thanks to the passage of the Patient Protection and Affordable Care Act in 2010), the demand for healthcare is higher than ever and projected to continue to rise. In response, new medical schools have opened and existing ones expanded the number of seats in their classes in an effort to increase the supply of physicians. This growth is good news for aspiring physicians; however, the increase in the number of places available in medical school classes has been accompanied by an increase in the number of applicants to both allopathic (MD) and osteopathic (OD) medical schools. To understand what all this information means to you, check out this graph, which compares the number of applicants and available medical school seats for the entering class of 2012. With nearly 15,000 applicants for about 5,300 places in osteopathic schools and slightly over 45,000 applicants for about 19,500 seats in allopathic schools, there are almost three applicants for every DO spot and two to three for every MD spot. 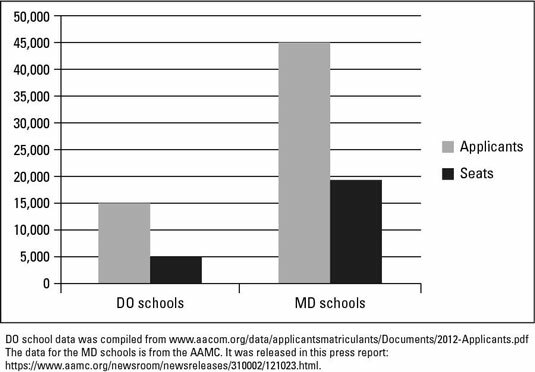 However, as you evaluate these numbers, note that some applicants apply to both allopathic and osteopathic schools, so the total number of unique applicants is less than the number of DO and MD applicants combined. The most important factors in determining your chances of admission to med school are your grade-point average (GPA) and Medical College Admission Test (MCAT) score. Even an applicant with amazing extracurricular experiences and outstanding letters of recommendation is likely to be denied admission if she can’t demonstrate the academic potential for medical school. Many schools do an initial assessment based on your GPA and MCAT score that determines whether your file advances to the next stage of review or is denied. Even if you make it all the way to the interview stage, MCAT score and GPA are often still important determinants of the committee’s final decision. Notice that the MCAT scores for matriculants to allopathic schools is considerably higher than for osteopathic schools. This gap is one of the biggest differences between admission to DO and MD schools and makes osteopathic medical schools an option worth investigating for applicants for whom the MCAT is a weakness but who have an otherwise strong application package. For any school, allopathic or osteopathic, having a lower-than-average MCAT score or GPA certainly doesn’t guarantee you won’t be admitted, nor do great numbers ensure you’re in. However, your chances of admission are greater if you have high grades and a good MCAT score, so excelling academically is the best way to give yourself an advantage in a very competitive process. An excellent resource for statistics about applicants and matriculants to medical school are the AAMC FACTS tables. Extracurriculars: Clinical experience, research, community service, leadership, and other activities are part of the package you have to offer and are vital to the application. Strong personal character: Maturity, compassion, professionalism, and good interpersonal skills are qualities that schools seek in applicants. Because these personal characteristics can’t be quantified through grades and standardized tests, letters of recommendation and the interview are also critical components of the admissions process. Intangibles: Your background, obstacles you’ve overcome, your ability to contribute to the diversity of the class, and other intangible factors come into play when a committee considers your application. The admissions process isn’t simply about the percentile you achieved on the MCAT or the number of As you’ve earned; it’s also about what you have to offer as an individual.